I wrote a post over a year ago on the Principalship and the most important aspects of the position. As I move further along into my fourth year, the position continues to be multi-faceted, fast moving, and ever-changing. Simply put, no one day is ever the same. The busiest days are typically the ones when the calendar is clear and I walk into school thinking that it will be an “easy” day. I’ve learned by now that there’s no such thing. The information comes a mile a minute and I can literally find myself in ten different conversations over the course of twenty minutes on topics and issues that are dramatically different yet critically and equally important. That happens all of the time. It’s the nature of the position. Pretty incredible, huh? And, amazingly enough, he probably got at about 50% of what a principal actually does. But rather than putting together a “Part II,” I instead discussed some of the most important aspects of being a principal. To use a baseball analogy, it was my “keeping your eye on the ball” list. I have since gone back to my original list and have made some updates. 1) Safety & Security: No matter how you look at it, student safety is by far the most important responsibility of any school leader. When parents send their children off to school each morning, they do so with an ingrained trust that their children will be “safe” and protected. From lockdown drills to debriefing with key security personnel as “real world” scenarios unfold both locally and nationally, it is the responsibility of principals to ensure that everyone is prepared for any and all emergencies in order to protect all students in the best possible way. In doing so, principals must not only know their building and campus both inside and out, but must have clear protocols in place to ensure efficiency and immediate response during any emergency. For us, that means strategically placed security cameras, protocols for entering and exiting the building, and clear roles and responsibilities for all members of our staff and security team. Unfortunately an emergency is only a day (or minute!) away, so it is imperative that all members of the organization can respond with little to no warning. 2) Building Management: Unfortunately, “old school” managerial skills are too often overlooked when schools are looking to select a principal. This has been particularly true in recent years as more and more attention is being place on both classroom instruction and the shift that is occurring in all schools as a result of the common core. While I’m not suggesting that instruction should take a back seat in any school, I’ve seen schools flounder with leaders who possess great instructional minds but little in terms of organizational and managerial skills. It is critical that principals have clear routines, procedures, and protocols in place for all aspects of building operations and to ask “what if” to all potential scenarios and adjust accordingly. Central to this is the importance of having a strong assistant principal (@careim2) as well as a staff who both carries out these tasks and makes sound recommendations for ongoing improvement. 4) Empowering Others: Perhaps the best advice that I ever received about the Principalship was from my former principal in New York City. As an assistant principal, I took on everything, micromanaged all aspects of the building, and basically had a direct hand in all tasks that required completion. She warned me at the time that this approach would ultimately sink me as a principal. While the adjustment was difficult at first, I have seen our school and organization rise to new levels in recent years as more teachers and staff members are empowered in all areas, including professional development, building protocols, and academic programs and initiatives. At DFHS, this has been especially critical as our school enters year two of our 1;1 Chromebook initiative while simultaneously preparing for authorization to the IB Middle Years Program (MYP). I’ve written several posts over the past year on this topic, including two on “the power of empowering.” Check them out! 5) Getting Inside the Classroom: Visiting classrooms and supporting teachers with practical feedback is perhaps the best form of instructional leadership and professional development that a principal can provide. It is also the best way to get the true pulse of the school and the needs of the students. Too often, principals pay “lip service” to the idea of getting inside of the classroom and then spend most days dealing with issues behind closed doors. Of course, getting out of the office is sometimes easier said than done, so it is important to build time into the schedule each day to make sure that it happens. 6) Focusing on Students: Principals can become so easily bogged down with issues and minutiae that they can lose sight of why we are really here in the first place. Don’t let that happen! A general “self-check” for principals is to consider how each issue either impacts or furthers the education of the students in that respective school. If it doesn’t, then chances are it is time to turn the wheel and head in a different direction. 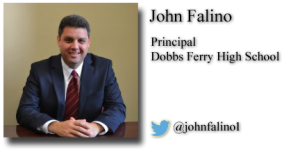 John Falino is a Principal at Dobbs Ferry High School. He shares his insights on his website, On Principal. 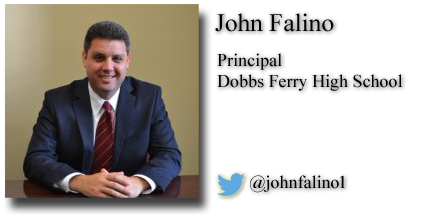 Follow John on Twitter at @johnfalino1.